The Swimmers is a short novel published this past September by Frisch & Co. – an e-book only publisher focusing on translated fiction. Ostensibly about the end of the world, it features no natural disasters, barren landscapes or bands of survivors fighting savagely over the few resources that remain. Azaústre’s vision is much more surreal, one could argue that it is meant to function as metaphor. Jonás is a photographer who has grown too accustomed to interacting with the world through the lens of his camera. Which might be why his girlfriend left him and why his art career, once so promising, has stalled. He is an only child of divorced parents and carries that slightly clichéd aura of loneliness and isolation with him. The most important person left in his life is his best-friend, Sergio. The two have a relationship more like brothers than friends. They meet regularly at a pool in Jonas’ old neighborhood to swim laps. The novel’s protagonist, Jonás, goes to the pool almost every day, where he swims 2,500 meters. The book is broken up into 50 chapters, representing laps in the pool; as I learned during the translation process, an Olympic-size pool is 50 meters long, so essentially the book (50 laps x 50 m) is the equivalent of one swimming session. I read the prose, and especially the rhythm, as an imitation of the act of swimming. Most chapters start off a bit slow, with short(er), sharp(er) sentences, like diving in or kicking off from the wall, and then the sentences start flowing into one another, like strokes and kicks. The carefully choreographed rhythm of the prose (apparent even without reading Lyndes) has a soothing effect and lessens the impact of the events driving the story. People are vanishing into thin air. Not to be confused with abductions and/or kidnappings – men, women and children in the city where Jonás’ lives are simply no longer there. Their disappearances are almost supernatural. First, other swimmers at the pool. Then, Jonás’ mother. In quick succession: the daughter and grand-daughter of an older swimmer who Jonás meets regularly at a cafe; followed by a fellow artist and, then, the daughter of an underworld boss. As the pages pass the urban environment through which Jonás moves steadily empties. Azaústre manages to create the feeling of a physical world expanding as, in almost direct correlation, Jonás sheds his personal relationships and connections. The disappearances come to represent an existential detachment. At the same time they create discomfort in the reader – a primal response to the idea of non-existence. Joaquín Pérez Azaústre is a novelist and a poet; with the ability to evoke the full range of sensory details. He’s particularly strong when describing abandoned places. He breaks down the space into units of time – individual moments which the reader explores with the protagonist. Beautiful, haunting imagery appears all throughout The Swimmers. Azaústre’s writing is a combination of Camus, a young Stephen King and the great Rod Serling (The Twilight Zone). He challenges our preconceptions of reality in new and interesting ways. He plays with the concept of negative space, twins, reflections and parallel universes. But he does it in a way that seems to exclude the fantastic. There could be a logical explanation for all this. In the meantime, people and events constantly move in and out of the periphery of the story. It’s five in the afternoon. The clarity of the foothills is enveloped by the specter or rain. There is no countryside beyond the city, just a wasteland, a barren stretch of dry earth. On the right-hand shoulder, the bus leaves behind a hamlet of moveable homes and shacks erected with miscellaneous materials from demolition sites. He sees no one, not a single face. They take off so quickly that later, after driving out of sight of the wood and tin huts, some of them made from old emptied-out bodies of cars and trucks, scrap metal with plastic curtains and tarp roofs, Jonas starts to doubt their existence, as if the expulsion from the city had turned them into phantasms, as fleeting as the rest of the bare mounds of earth. Everything about the novel – the prose style, the structure, the characters and settings – feels purposeful. The author has a bigger idea in mind but it’s too much to absorb in just one reading. I can’t say, definitely, what The Swimmers is about. Upon finishing it I was left with an impression of thoughtful writing, a plethora of ideas, and the yearning to understand something that seemed important. Or maybe I’m reading too much into it? The Swimmers could just be one of those books that exists simply as the sum of its parts – regardless of our expectations (or desires) on how those parts should connect. If you’re looking for something light and breezy to take along on Summer vacation, I recommend Frank Deford’s new novel. Set at the 1936 Berlin Olympics on the eve of WWII – Bliss, Remembered is, among other things, an all-American coming of age story. When Sydney ‘Trixy’ Stringfellow’s father dies she dives into the local river, starts swimming and doesn’t stop. She’s surprised to learn that she’s pretty good at it. Better than pretty good. Sydney enters a local competition, one thing leads to another, and before long she finds herself part of the 1936 U.S. Swim Team headed for Berlin. There she meets and falls in love with a handsome young German… which is when things really get interesting! …But here’s the thing: as soon as it died out, I pretty much forgot that part. It’s like: who remembers ‘The Star Spangled Banner’ after the ballgame is over? When it was done, it was gone, and I only kept thinking about everything beautiful that’d come before. ‘Vas you dere, Charlie?’ Ya, I vas dere, Teddy, but I still didn’t get it. And neither did anyone else. Deford get’s the little things – like what a young girl in love would make of Nazi Germany prior to the start of WWII – convincingly right. The whole atmosphere feels authentic, and because of it I completely bought into Bliss, Remembered. I was behind Sydney at every step of her journey. When she was separated from her German lover, Horst, I couldn’t turn the pages fast enough. When a new romantic interest appeared, a sweet and vulnerable boy from Brooklyn, I was completely torn. I couldn’t wait to find out how Sydney’s story would end. But the charm of Bliss, Remembered is that it is more than a love story. It is also a sports novel, a historical novel and a war novel. There’s even a bit of espionage thrown into the mix. 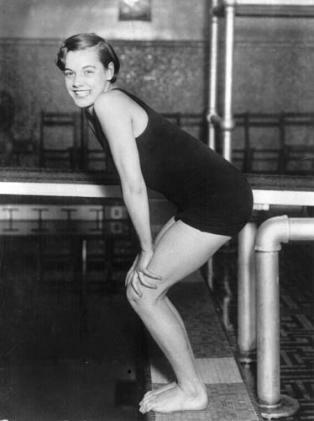 Eleanor Holm "Queen of the Backstroke"
Unfortunately, I’m not sure everyone will find the novel to their tastes. If you’ve ever listened Frank Deford’s sports commentary on NPR you’re already familiar with the folksy tone in which Bliss, Remembered is written. The two narrators, Sydney and her son Teddy, sound an awful lot like Deford – and are subsequently almost indistinguishable from each other. At times I questioned why Deford included Teddy at all, as the character doesn’t contribute a whole lot in terms of plot or structure other than to repeat word-for-word Sydney’s story. In point of fact, I found the interaction between mother and son intrusive on the narrative. And if you don’t like colloquialisms, the dialogue can quickly wear thin (Sidney repeatedly asks ‘what the kids are calling it these days’). But, if you like Deford’s style (which I do) then you’ll like this book. Sydney, a heroine in every sense, definitely falls into the spunky category. Spitfire, sassy, smart, saucy, refreshing and impudent are other adjectives that come to mind. And she tells one hell of a story: spacing it out, building the suspense like a pro and always leaving her audience wanting more. So go throw on some Artie Shaw… or, better yet, The Andrew Sisters singing Bei Mir Bistu Shein. Grab a copy of Bliss, Remembered, a tall glass of ice tea and enjoy the summer.